Are you seriously hunting for the M.Sc Jobs 2018? then this page is the one stop place for the candidates to get the complete information about the Master of Science jobs. We are providing the department wise IT Jobs in the below of this article. We have updated the M.Sc Computer Science, Electrical Engineering, Industrial Engineering and Operations Research, Applied Physics, Mathematics, Biomedical Engineering, Chemical Engineering, Civil Engineering, Mechanical Engineering, Earth and Environmental Engineering etc department jobs on this page. There are a wide variety of opportunities for the M.Sc candidates. So, candidates, those who are seeking for the M.Sc Fresher Jobs can check the upcoming jobs from this page at free of cost. Find out the best job form the M.Sc Jobs 2018 and apply as early as possible. The candidates who are having good background academic record can easily get the job in their dream company. We suggest the candidates to take their own time to check the latest Job Openings for M.Sc Freshers on this page. Candidates can apply for the single job are multiple jobs by checking from this page. Well while applying for the jobs the aspirants have to check the skills are suitable for the particular job opening or not. Many of the M.Sc graduates are doing hard to work to get the job in any of the IT companies. 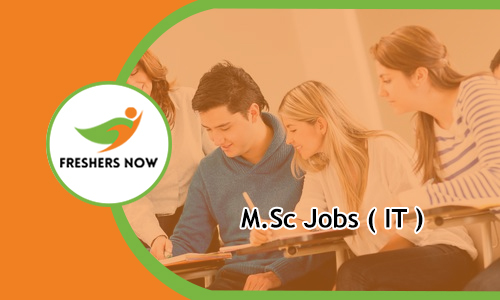 There are a number of job opportunities for the M.Sc freshers in various cities such as Bangalore, Mumbai, Delhi, Rourkela, Jaipur, Nagpur, Chandigarh, Kochi, Chennai, Bhubaneswar, Ahmedabad, Guwahati and in some other cities. Candidates who interest in M.Sc Jobs 2018 can apply for the vacancies by going through this article. The Master of Science is also known as MSc, M.Sc, MS etc. This M.Sc is a Master Degree in the field of Science. M.Sc is a postgraduate level program offers in many of the colleges and universities in India. Usually, this degree is awarded for the candidates in a subject in natural Science, Maths, Medicine, and Technology. The duration of the program is 2 years in any of the colleges. There may be a change in the duration as per the specialization. The aspirants can acquire theoretical as well as practical knowledge in Biology, Physics, Nursing, Chemistry, and some other. In each and every specialization there are a vast number of openings for the aspirants. Please read this article completely for some idea about the M.Sc jobs. Each and every job openings for the M.Sc graduate freshers is available on this page. There are hundreds of M.Sc Jobs 2018 across India. For those jobs, thousands of aspirants are applying. The contenders who had the passion to work within IT Sector after completing the M.Sc can check the eligibility details from this page. Some of the aspirants are choosing the IT Jobs after M.SC because of high paying and more beneficial. Our main intention to prepare this article is to provide the Job Vacancies for M.Sc freshers. Refer the above table and pick the suitable job and apply for the jobs before the final date. Candidates have to apply in the online mode. The candidate are selected by conducting the various rounds such as written test and personal interview. Find out more Walkin Drives on our website. On this page we are providing the Job opportunities for M.Sc Physics, Job opportunities for M.Sc Chemistry, Job opportunities for M.Sc biology, Job opportunities for M.Sc Nursing and some other specializations. Not even in the IT sector, the M.Sc graduates can step into the government sector companies. M.Sc Jobs 2018 are in many organizations such as UPSC, SSC, Defence, Banks, RBI, CPF, BSF, ONGC, HPCL, Indian Oil Corporation and many other companies. Apart from this, the M.Sc graduates can grab the job in teaching field. The M.Sc Physics and M.Sc Chemistry candidates can move on to the research side. There are a lot of research organizations present in our country for M.Sc freshers. The Physical Research Laboratory Ahmedabad, Saha Institute of Nuclear Physics Kolkata, DRDO, Nuclear Science Centre New Delhi. This page is the accurate place for the candidates to get the M.Sc Jobs 2018. We equipped all the information about the Master of Science Job Openings in an understandable manner. Finding the right career option is a big task for the candidates after completing M.Sc. The selection process is different for every company. The company officials conduct the rounds as per their rules. So to all the rounds candidates should have good knowledge and skills as per the job role. Most of the candidates clear the written test easily by referring the Syllabus and Placement Papers. So prepare well by using this stuff and be the first one to get the job. We advise the aspirants not to miss this opportunity by neglecting the preparation. The contenders who are continuously looking for the Jobs after M.Sc can stop searching. This article is to provide the latest as well as upcoming M.Sc Jobs 2018 for the aspirants. Nowadays a huge number of companies are conducting the Off Campus Drives M.Sc graduate freshers. We suggest the aspirants to simple apply and attend for the drive to acquire the job easily. The MNC companies are offering the vast number of openings by offering good pay scale. Candidates can also check the other qualification IT Jobs on our web portal. We hope the information about the M.Sc Jobs 2018 is useful for the candidates. Stay in connect with our website Freshers Now on regular basis. Aspirants can also make a bookmark of this page for the latest updates.